When people think of the Middle East, some of the first things they would think would be the abundance of wealth and opulence. All that wealth came from exporting the one most-demanded natural resource subject to global pricing which would have a ripple effect across markets worldwide – crude oil and natural gas. Aside from the export of oil/natural gas that has been the source of the region’s wealth, it is bound to dry up sooner or later as people see the benefits of cleaner energy sources. Diversifying to other industries can help to fill the void, but they would have to be stable enough to be sustained for many years and economically viable such that they make significant contributions to the country’s GDP. One Middle Eastern country – Qatar – is making a big push into manufacturing something that you probably never expected, but it’s already spreading across the globe. None other than electric vehicles. Sounds very lofty and slightly crazy for a country like Qatar pursue this? Some would say the same if they read this in the newspapers. 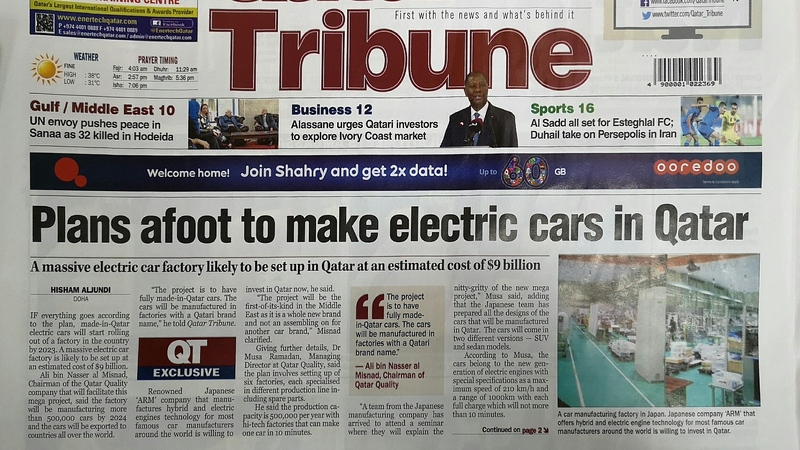 I spotted this on the front page of the Qatar Tribune before I decided to dig into it. Given the recent surge of diversifying from LNG exports, Qatar is already looking ahead to diversifying as a means of their economic growth. It was only months ago that Kahramaa opened the first of many electric vehicle charging stations in Qatar; Siemens Qatar is the one providing the technical aspects. Such a move is the first-of-its-kind in the entire Middle East, given the prevalence of oil/natural gas that has been the biggest source of the wealth in the region. To undertake this venture, you’re going to need some well-known experienced businesses who have the knowledge of electric vehicles. Japanese company ARM will be responsible for providing the technologies and experience to help build this nascent industry, with the aim of manufacturing 500,000 electric cars by 2024 that can also be exported to other markets. Though the manufacturing of “Made in Qatar” electric vehicles is still years away before it hits the roads of Doha, one major dealer is looking to gain the first-mover advantage by importing electric vehicles starting from 2019. It’s the best way to set-up the basic infrastructure so that it smoothens the adoption of electric vehicles (think of how people felt in the beginning when Apple removed the headphone jack from the iPhone 7, but now that has already subsided since everyone else is doing the same). Alfardan Group, known to be the official dealers of BMW and mini four-wheel vehicles, haven’t provided any details on which electric vehicle brands they will import. They could easily bring in some of BMW’s electric models, given that this would pique the interest in electric vehicles. The Middle East is a dry environment due to the arid desert climate, combined with the humidity in the summer period. There’s already a cultural icon for the citizens in this region – sturdy and/or luxurious off-road vehicles from brands like Toyota, Lexus, Porsche, Nissan, Ford, and many more. These global car brands offer the performance and durability of navigating this region’s climate, albeit using gasoline-powered engines even with improvements to fuel economy and environmentally-friendly technologies. Most of the citizens love to drive these gasoline off-road vehicles, and it’ll take years before people accept an electrical alternative that can match the performance of a gasoline-powered equivalent. The benefits of an electric vehicle are outweighing those of gasoline-powered ones, as they’ll easily reduce the carbon footprint in a region that has already seen rising temperatures.